We always hear individuals say that beer is not good for health. But surprisingly beer also has many health benefits, and from now on, you can enjoy every sip of it without any guilt. Studies have found out that beer not only expands lifespan but is also very beneficial to health. Small and hard lumps created by the concretion of salts that are found in the ducts of the gall bladder or the kidney’s are called gallstones or the kidney stones. They are often caused by dehydration. However, medium or limited beer consumption is very helpful in handling these. Always remember to consult your doctor before consumption. We all are aware that the older we get, the slower our brain functions. Light to medium or limited amount of beer consumption reduces risk of cognitive decline and Alzheimer’s disease. Regularly drinking beer reduces the risk of heart diseases by 30 percent. It also has good anti clotting effects, which help in keeping blood vessels clean, free and healthy. In fact, researchers found that individuals who drank one beer daily had lower levels of fibrinogen, a protein that helps to reduce blood clotting. Beer in limited or medium quantity may promote good bone health, thanks to its high silicon content. Silicon helps in stimulating bone-building cells, and the estrogenic effect of beer also helps attain healthy bones. Here is another amazing health benefit of drinking beer! Beer is very high in antioxidants and flavanoids which are very helpful in reducing cancer risk, especially prostate cancer for men. So next time enjoy every sip of beer you drink. A research, performed at the Food Research Institute, found that beer-drinking individuals had much higher levels of Vitamin B in their blood compared to the non-drinking individuals; surprisingly beer is healthier as compared to wine as it contains double the amount of Vitamin b compared to wine. It also has Vitamin B12 and folic acid, both of which are very beneficial. Harvard research on many middle aged men recognized that the individuals who drank beer occasionally had a rise in their alcohol intake to few beers, making their possible risk of suffering from diabetes reduced drastically. But all these benefits are only applicable to limiting the intake to two drinks every day. The U.S. Department of Agriculture reported that medium or limited drinkers live longer. It also states that medium or limited drinking prevents almost about 26,000 deaths a year, as it tremendously lowers the risk of diabetes, strokes and many other heart ailments. Wine is nice for your heart, but beer may prove to be even better. 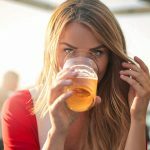 An individual study of around 60,000 women aged between 25 to 40 found that drinking beer helps in preventing high blood pressure or any other problems related to it compared to the other women who consumed wine. Many researchers of some renowned research units of health found that medium amounts of beer consumption helps in preventing blood clots which are usually responsible for blocking blood flow to the heart and other organs of body. These clots can also cause strokes and many other life threatening diseases or conditions. Now that you are aware of these 10 surprising benefits of beer for health, I am sure you will definitely sip in beer to avail its benefits.